Lidia Lagovschi began working with King & Bay in 2017 for the Corporate Development team. She delivers expertise in areas of corporate communications, marketing, and brand management, extracting meaningful analytics to further advance King & Bay as an incubator and to advance the portfolio of public and private companies King & Bay serves. 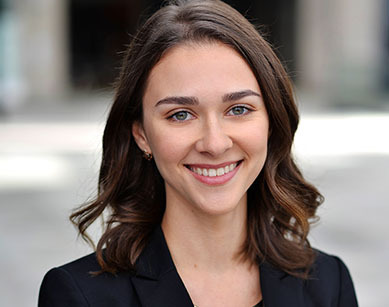 Prior to joining the King & Bay team, Lidia obtained a Bachelor of Business Administration degree from the British Columbia Institute of Technology. At BCIT, Lidia co-led the consulting team chosen to re-develop BCIT’s Program Advisory Committee business model, using industry-approved research methods. Combined with her customer service and applied business training experience, Lidia brings to King & Bay over four years of business-development support in areas of digital marketing for small-to-mid sized start-up companies. A: I started with King & Bay in September of last year. I’m currently a Corporate Development Officer but I started out as an Intern. A: An average day could include updating our websites, building Excel spreadsheets, and researching ways to improve various processes, usually technologically. A: You will most likely find me tucked away with a warm cup of tea, fuzzy blanket, and a good jigsaw puzzle with a podcast playing in the background. I also love travelling so I go somewhere whenever possible, usually on long-weekends.